Murfreesboro dentist, Dr. Jeff Farmer, now offering mini dental implants to his patients. The dental practice in Murfreesboro is family friendly and welcomes their Hispanic community. Dr. Farmer has served the Middle TN area for more than 25 years, combining quality service and high tech dentistry, He strives to always ensure the comfort of his patients. 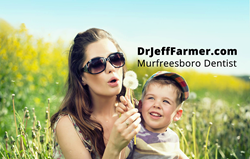 Dr. Jeff Farmer now offers mini dental implants at his Murfreesboro, TN office. The mini implant is placed into the bone, usually without surgery, and the denture or partial to be stabilized is fitted and snapped into place. For those having trouble with dentures or partials shifting while eating or talking, mini implants could be the solution. Thousands of patients around the world now enjoy secure dentures that snap right in place without any adhesives. It is all made possible by mini dental implants that are placed in the jaw through a short, minimally invasive procedure. These mini implants can function as long-term supporting structures rather than as short-term or medium term devices. In fact, some have been successfully functioning in patients' jaws for several decades. In the past several years, clinicians have been utilizing MDI's for single tooth replacements and in crown and bridge cases. Dr. Farmer received his B.S. in biology from Middle Tennessee State University and earned his doctorate in dentistry from the University of Tennessee at Memphis. He has served the Middle Tennessee area for more than 25 years, combining quality service and high tech dentistry at his Murfreesboro dentist office. His mission is to educate everyone on all their dental options and to earn their trust and confidence by providing the most innovative techniques and services in a comfortable, caring environment. Website designed by GoHooper.com - a Nashville based web design agency.